Please join us as we host local brokers, developers and builders at our annual Community Development Day on May 13th at The National Golf Club of Kansas City. Cost is $200 per member and that includes golf, lunch, drinks on the course and 19th hole drinks and food plus great networking opportunity with the local real estate community and developers. A limited number of spots are available so first come, first served. Sponsorships include a booth at the Community Expo, golf at The National, your company's name and logo on event and marketing materials, as well as food and beverages. Connect with us to get early updates and Platte County business news. New Terminal at KCI Breaks Ground! The Platte County EDC joined in the celebration for the long-awaited groundbreaking to build a new single terminal at KCI Airport this week. Demolition will begin soon and last for six months. Read the latest news on the new KCI single terminal project from Edgemoor HERE. North Kansas City Hospital offers health classes, events and complimentary wellness screenings. See full details for classes on their WEBSITE. All Platte County companies are welcome to send us information and flyers for upcoming hiring events, which we will share on our website jobs page as well as social media. If you have a hiring event to list, please contact Stephanie Deppen. Just a gentle reminder to get out and vote Tuesday, April 2nd. Municipalities, fire districts, ambulance districts, school boards have ballot issues. To see what is on the ballot in Platte County, click here. The Platte County EDC Board of Directors endorsed and supports Parkville’s Proposition P which is a sales tax of ½ of 1% for the purpose of providing funding for local parks including, land facilities and operations for the City. The Platte County EDC Board of Directors also endorsed and supports Platte City’s Bond Questions 1 and 2. Question 1 is a general obligation bond in the amount of $3,200,000 for the purpose of acquiring, constructing, furnishing, equipping and improving City buildings, facilities and structures. Question 2 is a general obligation bond in the amount of $2,500,000 for the purpose of acquiring rights-of-way and designing, constructing, reconstructing, extending and improving highways, streets, roads, sidewalks, and bridges in the City. Every vote counts, be sure to cast your ballot! The bridge construction is on schedule to be completed by the end of the year. Follow the construction progress for all the projects near Tiffany Springs MarketCentre HERE. Work is underway on Prairie View Road near 64th Street and expected to be complete this mid-summer 2019. Follow the project HERE. Construction on Skyview Ave from Ambassador Drive to Tiffany Springs Road is scheduled to begin early spring 2019. A contractor was selected for the 72nd Street project and construction is scheduled to start in early spring. Follow the project HERE. The Platte County EDC engaged the Docking Institute of Public Affairs to provide a labor study report to assess the available labor pool within the Platte County Labor Basin. The Docking Institute conducted research and 1,090 phone surveys within the 8-county labor basin to complete the assessment. We are excited to share the findings with you. You can view the full report as well as our workforce presentation at the links below. Kansas City Aviation Department, Spire Energy, KCP&L - An Evergy Company, City of Riverside, and the EDC of Kansas City. During inclement weather, PCEDC will cancel committee meetings if the Park Hill School District closes. Polsinelli law firm provides value through practical legal counsel infused with business insight, and focus on health care, financial services, real estate, intellectual property, mid-market corporate, labor and employment, and business litigation. Four Points by Sheraton Kansas City Airport is conveniently located minutes from Kansas City International Airport (MCI). Kansas City Aviation Department reports that 827,733 passengers arrived and departed through Kansas City International Airport’s gates in January, a 2.0% increase from January 2018. Passenger boardings were up 2.0%, with a total of 413,777 boarded. For the year to date, total passengers in and out total 827,733, up 2.0%. Year-to-date passenger boardings are 413,777, up 2.0%. Don't miss the chance to share your thoughts! MoDOT is still accepting comments for the environmental study through March 7th. All Platte County companies are welcome to send us information and flyers for any upcoming hiring events, which we will share on our website jobs page as well as on social media. If you have a hiring event to list, please contact Stephanie Deppen. The bridge on Route 152 over I-35 will be closed for 4 months beginning in May 2019. Lane closures on Kansas Street and Route 291 will also be expected during construction. The project is expected to be completed by the end of August 2020. Although the project is in Clay County, it impacts the entire Northland. You can view a simulation of the new interchange, construction maps, and detour maps HERE. The Governor's $350 million bonding proposal could advance the funding of 4 bridge replacements in Platte County. The Platte County bridges are part of 28 total bridges in MoDOT's Kansas City District that are scheduled for repair or replacement in the current STIP. The Buck O'Neil Bridge is not on this list of bridges. Learn more about the Governor's proposal HERE. Follow progress on construction of the new I-29 bridge near Tiffany Springs MarketCentre and other projects HERE. Work is underway on Prairie View Road near 64th Street and expected to be complete this spring. Follow the project HERE. The 72nd Street project from I-29 to N. Polk is out to bid. Construction will start early spring with a 18-24 month completion time frame. RSVP for the First Quarter Luncheon! Join us as we hear about the Best in the Midwest initiative and how it will transform Missouri's Department of Economic Development into the top economic development agency in the Midwest. In case of inclement weather, PCEDC will cancel scheduled ﻿committee meetings if the Park Hill School District closes. We will discuss the new taskforces (I-29 Corridor and KCI Area Land Development) and set agendas for the year. The PCEDC office will be closed on Monday, February 18th in observance of Presidents Day. Join us for special guest speaker Rob Dixon with the Missouri Department of Economic Development. For more details or to sign up, click below. Last week at the Board meeting we provided the 2018 Annual Report which sums up a remarkable year of accomplishments under the leadership of Past Chair Aaron Schmidt. The Platte County Economic Development Council (PCEDC) has its own set of challenges in 2019. We again are faced will a zero based budget, which in simple terms means our revenues equal our expenses. As with our own businesses we should not be satisfied with breaking even. I am asking you to please keep in the forefront what PCEDC has done for your business and Platte County. I look forward to serving as Chairman and working with my team, Mike Duffy, Co-Chair, Mike Reik, Treasurer and the Past Chair, Aaron Schmidt. And as we all know, none of this happens without Alicia Stephens, Stephanie Deppen and Molly Ramirez. A special thanks to Stephanie Neppl for all her help in 2018 and we wish her the best of success in her new endeavors in Iowa. Let 2019 bring success to ongoing projects such as KCI Airport and the Northland Youth Sports Complex. Read on to find ways you can involved. We can't do our work without your support. The mission of PCEDC is to promote, enhance and grow economic development in Platte County, MO. In so doing, we strive to improve the business environment, our communities and the quality of life in all of Platte County. In late 2017, consultant Janet Ady conducted interviews with key stakeholders and a year ago she provided her report. Based on her findings, we got to work on the new plan. 2018 was the year of refinement and the new plan is a result of that effort. All strategies are mapped out in detail in our strategic plan. Advocate for development of public regulatory agencies and advise on positions the PCEDC should take on ballot and legislative issues. Develop real estate opportunities in the Kansas City International Airport business district, Twin Creeks and along the I-29 corridor. The efforts of two NEW taskforces will be under this committee. I-29 CORRIDOR TASKFORCE: This taskforce will consider opportunities for greenfield development as well as identifying areas needing redevelopment/ reinvestment / repurposing. KCI AREA LAND DEVELOPMENT TASKFORCE: This taskforce will be tasked with looking at the potential for development of the thousands of acres on the west side of the airport as well as land in the KCI Area Plan. This committee oversees the operation of the PCEDC. Its tasks includes a quarterly meeting to review financial reports and make recommendations to the executive committee.The efforts of two NEW taskforces will be under this committee. During inclement weather, PCEDC will cancel meetings if the Park Hill School District closes. As recommended by the Public Policy Committee, the PCEDC Board of Directors took a position regarding the proposed KCMO Pre-K sales tax ballot issue. John Elliott made the motion that although the PCEDC believes in the need for Pre-K education for ALL children, it does not support the proposed sales tax as a funding mechanism. Dale Brouk seconded the motion. Cathleen Flournoy and Nathan BeVelle abstained. The remaining Board members voted in favor and the motion passed. The PCEDC feels strongly that this discussion needs to occur with our leaders at the State. The Missouri Department of Transportation will hold a public information meeting concerning the current US-169 Buck O'Neil Bridge Environmental Study. Zona Rosa wants your input! Provide your feedback by taking a BRIEF SURVEY. Kansas City Aviation Department reports that 11,850,825 passengers traveled through KCI Airport in 2018, up 3.0% from 2017. December totals were up 3.6% from 2017 figures, with 947,120 passengers arriving and departing through KCI's gates during the month, which marked the busiest December on record. KCI Area Development Committee will NOT meet in January. KCI TIF and Platte Purchase TIF advisory committees will jointly meet on Wednesday, January 16th, at 8:00 am in the Platte County Resource Center. The Public Policy Committee will meet on Thursday, January 17th at 7:30 am in the Platte County Resource Center. The Board of Directors will meet Friday, January 25th at 7:30 am in the Platte County Resource Center. Thank you to our sponsors, elected officials and members for your support of our 28th Business Excellence Awards. We honored 18 Platte County businesses, and you can read all about them and see photos here. KCI Area Development will NOT meet again until February 7, 2019. KCI TIF Advisory Committee and Platte Purchase TIF Advisory Committee will meet at 8:00 am on Wednesday, January 16th. Public Policy Committee will meet at 7:30 am on Thursday, January 17th. The Platte County EDC Board of Directors will meet at 7:30 am on Friday, January 25th. To view the PCEDC events calendar, click here. To view previous meeting minutes, click here (the password is pcedc2017). Click here to read the latest news from the KCI New Terminal project from Edgemoor. North KC Hospital offers health classes, events and complimentary wellness screenings. See full details for classes on their website. Platte Valley Bank offers a monthly "Eat & Educate Events for Small Business" series in partnership with Mid-Continent Public Library. Register online here. Kansas City secures $25 million in Federal funds for Buck O'Neil Bridge. Read more here. Follow construction on the new I-29 bridge near Tiffany Springs MarketCentre here. Skyview from Ambassador Drive to Tiffany Springs Road will go to bid soon. Work on 64th Street & Prairie View Road has begun. Follow the project here. Project details are being finalized for the southern section of the NW Prairie View Road work. Bids for the 72nd Street project are due next month. Construction will start late fall/early spring with a 18-24 month completion time frame. Please join the Platte County Economic Development Council as we recognize businesses that have made a significant impact on Platte County through the development of jobs and economic growth. which is at every seat, and in the PowerPoint presentation. The sponsor will receive reserved seating for 10. If you have questions or are interested in sponsoring this event, please contact Stephanie Deppen at sdeppen@plattecountyedc.com or 816-270-2134. KCI Area Development will NOT meet until again February 7, 2019. Public Policy Committee will NOT meet in December, and will resume meeting in 2019. KCI TIF Advisory Committee and Platte Purchase TIF Advisory Committee will next meet at 8am on Wednesday, November 28th and tentatively Wednesday, December 19th. The Platte County EDC Board of Directors will NOT meet in December. To view the PCEDC events calendar, click here.To view previous meeting minutes, click here (the password is pcedc2017). The Missouri Department of Transportation reopened the Buck O'Neil (Highway 169 over the Missouri River) Bridge after a rehabilitation project. Crews closed all southbound traffic of the aging structure back in mid-May in order to repair cables, railings, the medians and the expansion joints on the structure. The Buck O'Neil Bridge is more than 60 years old and sees on average of about 40,000 vehicles each day. The repair project cost an estimated $7 million and was a cost-sharing agreement with the City of Kansas City, MO. Currently; an environmental study is being conducted on the bridge. The study will be used to help determine the feasibility of a new bridge. MoDOT would like to thank the citizens of Kansas City and all of its partners for their patience. At our November Board meeting, Helmut Derra, shared the history of Haldex Brake Products and the services offered. Haldex is a Sweden-based company, operating worldwide with offices in 18 countries. They develop and provide reliable and innovative solutions that improve safety, vehicle dynamics and environmental sustainability in the global commercial vehicle industry. Ignite Medical Resorts held its open house on November 15th at 2100 NW Barry Rd, KCMO. Biolife Plasma Services is now open at 8761 N Ambassador Dr, KCMO. BioLife Plasma Services is a state-of-the-art facility dedicated to collecting quality plasma in a safe and clean environment. Congratulations to the Marriott Kansas City Airport for being honored with the Renovation Excellence award at the Marriott International National Association & Full Service Owners Conference recently. Read more here. Congratulations to North Kansas City Hospital for receiving the Magnet® designation, the highest recognition for nursing excellence awarded to only 8% of hospitals in the US. Read more here. Click here to read the latest latest news from the KCI New Terminal project from Edgemoor. Kansas City Aviation Department announced that 1,077,849 passengers arrived and departed through KCI's gates in October, a 5.8 percent increase from October 2017 and the largest volume of October passengers in the airport's history. Passenger boardings were up 6.9 percent, with a total of 537,476 boarded. For the year to date, total passengers in and out total 9,930,090, up 3.1 percent. Year-to-date passenger boardings are 4,968,028, up 3.3 percent. Platte Valley Bank offers a monthly "Eat & Educate Events for Small Business" series in partnership with MidContinent Public Library. Register online here. The 72nd Street project is finalizing rights of way with MODOT and once it is approved next month, the project will move for bidding. Construction will start late fall/early spring with a 18-24 month completion time frame. The Public Policy Committee will meet on Thursday, November 15th at 7:30 am in the Platte County Resource Center. The Board of Directors will meet Friday, November 16th at 7:30 am in the Platte County Resource Center. KCI TIF and Platte Purchase Redevelopment District advisory committees will jointly meet on Wednesday, November 21st, at 8:00 am in the Platte County Resource Center. KCI Area Development Committee will NOT meet in December. Please join us as we recognize businesses that have made a significant impact on Platte County. The sponsor's name and logo will appear on the printed event program which is at every seat, on the signage and in the PowerPoint presentation. The sponsor will receive two complimentary reservations for the event. The SaferMO.com website - www.SaferMO.com - is there to help Missourians learn about Proposition D, the statutory ballot measure for funding safe roads and bridges. Proposition D appears on Missouri's November 6, 2018, general election ballot. It was referred to state voters by the Legislature. Prop D phases in a 2.5 cents annual motor fuels tax increase over four years. The Platte County EDC Board of DIrectors supports Proposition D. If your company or organization is interested in receiving a presentation, please contact the office on 816-270-2109. This election ballot is full with many issues and candidates. Click HERE to go to the Secretary of State website to look up your ballot. KCI Area Development will meet at 7:30am on Thursday, November 1st, and will feature a major landowners' panel. The Platte County EDC Board will meet at 7:30 am on Friday, November 16th. KCI TIF Advisory Committee and Platte Purchase TIF Advisory Committee will next meet at 8am on Wednesday, November 21st. Park Hill and Platte County R-3 students participated in National Manufacturing Day activities. Manufacturing Day is a celebration of modern manufacturing meant to inspire the next generation of manufactures and takes place the first Friday in October. MFG DAY addresses common misperceptions about manufacturing by giving manufactures an opportunity to open their doors and show what manufacturing is. Approximately 140 students had the opportunity to tour 5 local advance manufacturing companies: Multivac, Haldex, Martinrea, US Farathane and Marlen International. Students had the opportunity to tour the facility floors and see equipment being manufactured first hand. They visited the different departments to learn about career opportunities available in the industry and education required for different positions. All five company tours were a success and the companies reported they enjoyed hosting the students and look forward to future opportunities to engage with education partners. To read more, and see photos, click here. A new KCMO.gov, the government website of the City of Kansas City, Missouri, is coming in 2019 and the City wants your input. The City is encouraging KCMO residents to complete the 10-question Website Community Survey on KCMO.gov and suggest ideas for improving the website. The survey is available until Nov. 2 here. TSi Geotechnical, Inc. specializes in geotechnical engineering, drilling, laboratory testing, and construction observation, documentation and field testing services. At our September Board meeting, Board member Darren Hennen, shared the history of Olsson as well as the services provided. Olsson is an engineering and design firm that provides services for public and private infrastructure projects. They specialize in complex projects that involve many disciplines, including site/civil, transportation, water, environmental, field operations, survey and facilities. At our October Board meeting, Board member Doug Doll with KCI Auto Auction shared the history of how the organization moved to Kansas City in 2008 from Elwood, Kansas. KCI Auto Auction offers a wide range of remarketing services including reconditioning, inspections, transportation, salvage auctions, equipment auctions, and Internet auctions. Congratulations to Northpoint Development who won first place in the medium size (101-250 employee) category in the 2018 Best Places to Work by the Kansas City Business Journal! Congratulations as well to Burns and McDonnell and JE Dunn for earning second and third place, respectively, in the 501+ employees and up category. And well done to our investors who were finalists: ARCO Construction, HNTB, McCownGordon and Terracon. Parkville's ROSNET was featured in the New York Times! Read the article "What Does He Do, Work in a Cave? Why, Yes." here. The Argosy Casino Hotel & Spa held a renovation party on October 24th to celebrate its multi-million dollar transformation. The changes include renovated guest rooms, hallways and hotel lobby. Saint Luke's North has earned Missouri "Show Me 5" recognition from the Missouri Department of Health & Senior Services. The award recognizes Saint Luke's North as a center of adoption of five evidence-based maternity care practices that support breastfeeding. This is also the first step to becoming accredited as a Baby Friendly Hospital. White Goss PC merged with Rouse Frets Gentile Rhodes on Sept. 30, creating a Top 10 law firm in the Kansas City area. Read more. Members of the Edgemoor Team and Kansas City Aviation Department hit the road in September to share the latest information on the KCI New Terminal. The team hosted 7 open house events across the metro, to give citizens greater insight into the ongoing design process, including how the project team is working to incorporate sustainability and other features that will enhance the passenger experience in the New Terminal. Here is a link to materials shared at the Open House. Click here for the latest KCI New Terminal update. KCI Airport reported its busiest September in history. Passenger boardings were up 4.1%, with a total of 477,339 boarded. For the year to date, total passengers in and out total 8,852,241, up 2.7%. Year-to-date passenger boardings are 4,430,552, up 2.8%. Read more. Reminder that the southbound lanes of the Buck O'Neil Bridge remain closed as work is being done underneath the bridge. Follow the project here. An environmental study for the Buck O'Neil Bridge is underway and will build on the recently completed planning and environmental linkages (PEL) study to further evaluate options to improve or potentially replace the bridge. The study, which is scheduled to conclude in late 2019, will require significant public input in the coming months. Two formal public meeting will be scheduled in 2019. Learn more about the study here. KCI TIF and Platte Purchase Redevelopment District advisory committees will jointly meet on Wednesday, October 17th, at 8:00 am in the Platte County Resource Center. The Public Policy Committee will meet on Thursday, October 18th at 7:30 am in the Platte County Resource Center. US Farathane is hosting a job fair on October 24th from 1:30 pm to 3:30 pm at their facility located at 4600 NW 41st St. Riverside, MO 64150. For additional information regarding open positions, click here. The Board of Directors will meet Friday, October 26th at 7:30 am in the Platte County Resource Center. You are invited to attend the Metroblue Riverfront presentation on either October 29th or 30th. At the public meetings you will have the opportunity to learn about Omaha's riverfront transformation and the possibilities that exist for Economic Development and Recreation along the Missouri River in the Kansas City Region. Click here to see flyer with additional information. The Platte County Economic Development Council held its Quarterly Member Luncheon on September 7, 2018 at the KCI Hilton. The luncheon was sponsored by TranSystems, and featured a panel related to the theme of "All Things Transportation." Click here for a recap. Our 2018 Business Excellence Awards will be held on Friday, December 7th from 11.30am-1pm at the Embassy Suites. Sponsorship information and an invite will be sent next month so keep an eye in your inbox! KCI Area Development will meet at 7:30am on Thursday, October 4th, and hear an update from Kansas City Parks and Platte County Parks. KCI TIF Advisory Committee and Platte Purchase TIF Advisory Committee will next meet at 8am on Wednesday, October 17th. Public Policy Committee next meets at 7:30 am on Thursday, October 18th. The Platte County EDC Board will meet at 7.30am on Friday, October 26th. A dedication of the Ed Bradley Sports Medicine Center was held in honor of our former Board Chairman, who was a dedicated Northland civic leader and supporter of Park University Athletics. The Missouri Department of Transportation has rescheduled the following closure of the Buck O'Neil (Broadway) Bridge. Crews will close all northbound lanes of the Buck O'Neil Bridge from 7 p.m. Friday, Sept. 28 through 6 p.m. Sunday, Sept. 30 for median replacement operations. This will be a 24/7 closure and will require motorists to find an alternate route. Read more. An environmental study is also underway and will build on the recently completed planning and environmental linkages (PEL) study to further evaluate options to improve or potentially replace the bridge. The study, which is scheduled to conclude in late 2019, will require significant public input in the coming months. Two formal public meeting will be scheduled in 2019. Learn more about the study here. Zona Rosa is now under the management of Trademark Property Company, a full-service real estate firm based in Fort Worth, Texas. "Zona Rosa is a popular destination in north Kansas City and we are excited to help write the next chapter of its story and come up with ways to better serve its market," said Terry Montesi, CEO, Trademark Property Co. "We have a strong track record of uncovering the hidden potential in these types of complex properties, and we see a big opportunity at Zona Rosa." Read morehere. The Full Employment Council is hosting a Hiring Fair in celebration of Manufacturing Day. This hiring fair is for workers that have recently been laid off as a result of the Harley Davidson plant closure and those who have recently completed training in warehouse, advanced manufacturing, and transportation (CDL). At this months Public Policy Committee meeting, Councilmen Scott Wagner and Quinton Lucas provided information regarding Kansas City's proposed housing policy. Kansas City has not had an official housing policy for over a decade. Instead, it's been dictated by HUD's 5 year policy. The proposed policy should be more defined, specifically consider the impact of the definition of affordable. Affordable is not required if not incentivized and if not a significant public investment in infrastructure. What is a significant investment? Expedited permitting for affordable projects puts other projects at the bottom of an already long process. Housing development costs could increase more. Profit margins for housing development have stayed the same for 20 years, but lot prices have increased by $20,000. Councilmen Wagner and Lucas indicated that the current proposed housing policy, is just a starting point of conversations. The intent is that the policy will not be a one size fits all. Synergy Services - Synergy Services strengthens the individual, family and community through crisis intervention, shelter, counseling, advocacy and education. City Rent A Truck - City Rent A Truck offers a full line of vans and work trucks for rent and lease. At our August Board meeting, Board Chair Aaron Schmidt, shared the history of Hunt Midwest and their services offered. Hunt Midwest is a Kansas City-based, full-service real estate development company with a focus on industrial, commercial, retail, mission critical, multi-family, senior housing and residential real estate. Lincoln Rackhouse, a division of Lincoln Property Co., has acquired a data center campus in Kansas City's AirWorld Center that covers nearly 260,000 square feet. Click here for more details. k12itc: Former Mr. K Award winner expands beyond education market. Read here. 'It's the real deal': Parkville mixes old and new for winning recipe. Watch the FOX4 news story here. Park University announced it has partnered with SD Strong Distilling to develop the 7 Year Big Boom Bourbon that will celebrate Park's 150th Anniversary. Read more here. Equity Bank was #2 on the Kansas City Business Journal's list of Kansas City's Top 10 banks by loan growth at midyear. Read more here. Click here to view the latest KCI New Terminal project news from Edgemoor Infrastructure and Real Estate, including design progress, pre-construction activities, development agreement and financial updates, and community outreach. Kansas City International Airport passenger traffic increased 3% in August. Year-to-date passenger boardings are 3,953,213, up 2.7%. Read more. North KC Hospital offers health classes, events and complimentary wellness screenings. See full details for classes on their website or click here for the October schedule. Platte Valley Bank offers a monthly "Eat & Educate Events for Small Business" series in partnership with MidContinent Public Library. Register online here. The next event is "Resilience, Peak Performance, and Stress Management and is held on October 17th. Reminder that the southbound lanes of the Buck O'Neil Bridge are now closed for a 7-month period. Work is being done underneath the bridge. Follow the project here. Skyview from Ambassador Drive to Tiffany Springs Road will go to bid soon and the intent is to start work in the early fall. We're excited to report that Zona Rosa is under the new management of Trademark Property Company, a full-service real estate firm based in Forth Worth, Texas. Read more here. The next open house meeting is scheduled for Tuesday, September 18th at the Northland Cathedral located at 101 NW 99th Street, Kansas City, MO 64155 from 4:30 pm to 6:00 pm. Click here to see all upcoming open house meetings. KCI TIF and Platte Purchase Redevelopment District advisory committees will jointly meet on Wednesday, September 19th, at 8:00 am in the Platte County Resource Center. The Public Policy Committee will meet on Thursday, September 20th at 7:30 am in the Platte County Resource Center. We will here from Councilmen Wagner and Lucas about proposed affordable housing ordinance. The Board of Directors will meet Friday, September 28th at 7:30 am in the Platte County Resource Center. Where: KCI Expo Center, 11730 N. Ambassador Dr.
KCI TIF Advisory Committee and Platte Purchase TIF Advisory Committee will next meet at 8am on Wednesday, September 19th. Public Policy Committee next meets at 7:30 am on Thursday, September 20th. The Platte County EDC Board will meet at 7.30am on Friday, September 28th. CVS Health officially announced the opening of its Midwest Distribution Center in Kansas City, Platte County on Friday, August 24th. The new distribution center in the KCI Corridor, when fully operational,will add more than 360 new jobs, as well as an additional 70 to 100 jobs through work with local businesses. Read more here. City of Kansas City leaders gathered in Kansas City, Platte County to kick off a reconstruction project on NW Prairie View Road. 2nd District Councilmembers Dan Fowler and Teresa Loar joined project representatives and partners at the August 6th groundbreaking. Read more here, and to follow the project's progress here. You are cordially invited to join us for the dedication of the Ed Bradley Sports Medicine Center in honor of the late Northland civic leader and supporter of Park University Athletics. Thursday, September 13 at 5:30 p.m. Please RSVP by September 6 to events@park.edu or 816-584-6214. The first round of layoffs for Harley-Davidson was August 3rd, which affected 170 employees. The Full Employment Council and Platte County EDC jointly hosted a hiring event for Platte County businesses to connect with displaced workers on August 10th. Fourteen Platte County employers participated in this event. The Full Employment Council, with assistance from the Platte County EDC, hosted a second hiring event for displaced workers on August 17th. More than 30 employers from the Kansas City region participated in this event. The Platte County Economic Development Council partnered with TeamKC and KCSmartPort to connect recently displaced talent with area employers in response to Harley-Davidson's layoffs at its Kansas City plant. Check this post for info on employers that are actively hiring and the KC Career Network. PCEDC has communicated with Harley's Real Estate Division and is building a file for the property. Harley distributed an RFP to identify a commercial real estate broker. PCEDC will work with the broker to backfill the space. The timeline is product off the line through May of next year and then close-out the facility in June and July. The SaferMO.com committee launched a website - www.SaferMO.com - to help Missourians learn about Proposition D, the statutory ballot measure for funding safe roads and bridges. Proposition D appears on Missouri's November 6, 2018, general election ballot. It was referred to state voters by the Legislature. Prop D phases in a 2.5 cents annual motor fuels tax increase over four years. The Platte County EDC Board of DIrectors supports Proposition D.
Click here to read our latest sector update, which includes market statistics, development updates and more. Braun Intertec is a full-service geotechnical, environmental consulting and testing firm. CVS Health is a pharmacy innovation company with a simple and clear purpose: to help people on their path to better health. Engaged Companies spans several industries, including logistics, technology, warehousing, finance, education, and athletics. Multivac is one of the worldwide leading providers of packaging solutions used to pack a range of products including; food products, life science and health care products, and industrial goods. ROSNET the industry leading provider of fully-integrated restaurant solutions. Click here to see the most recent renderings for the new terminal at KCI. The Draft Environmental Assessment is now available for review here. A public workshop and hearing will be held from 6-8 PM on September 24, 2018 at the Ambassador Bldg, 12200 N. Ambassador Dr, KCMO. The public comment period ends 10/2/18. Click here for more details. The Northland Career Center is offering computer, HVAC, and welding classes that business can send their employees to. NCC can also provide customized computer classes. Click here for the Community Education brochure with details. Congratulations to our Board Chairman Aaron Schmidt for being promoted to General Manager of Development and Construction at Hunt Midwest. Read more. Kansas City International Airport passenger traffic increased 3% in July. Read more. Worth Harley-Davidson helped grant a 'last ride' wish to a local man battling cancer. Watch. ARCO National Construction was named as one of KC's 50 fastest growing companies of 2018. Read more. The City of Weston was named the best day trip for the 15th straight year by Ingram's Magazine. Congratulations to ARCO National Construction KC, HNTB Corporation, NorthPoint Development, McCownGordon Construction, Terracon Consultants, Burns & McDonnell and JE Dunn Construction for being named in the Kansas City Business Journal as the best places to work in 2018. Read more. aka PCEDC loves orange barrels! Skyview from Ambassador Drive to Tiffany Springs Road will go to bid soon and the intent is to start work early fall. 2018 Third Quarter Member Luncheon! KCI Area Development will NOT meet in August. The next meeting will be at 7:30am on Thursday, September 6th. KCI TIF Advisory Committee and Platte Purchase TIF Advisory Committee will NOT meet in August. The next meeting will be 8am on Wednesday, September 19th. Public Policy Committee will NOT meet in August. The next meeting will be at 7:30 am on Thursday, September 20th. SAVE THE DATE - Our third quarter member luncheon will be "All Things Transportation" on Friday, September 7 from 11:30 am to 1:00 pm at the KCI Expo Center located at 11730 N Ambassador Dr, Kansas City, MO 64153. The panel will include Representative Kevin Corlew; Pat Klein, Aviation Director at the City of Kansas City; and Jeff Martin, City Engineer Capital Projects, Public Works, City of Kansas City, Mo. Watch for the invite coming soon. Follow the project here, and click here for the design plan. To view the Fox 4 News piece, which includes an interview with PCEDC Executive Director Alicia Stephens, click here. 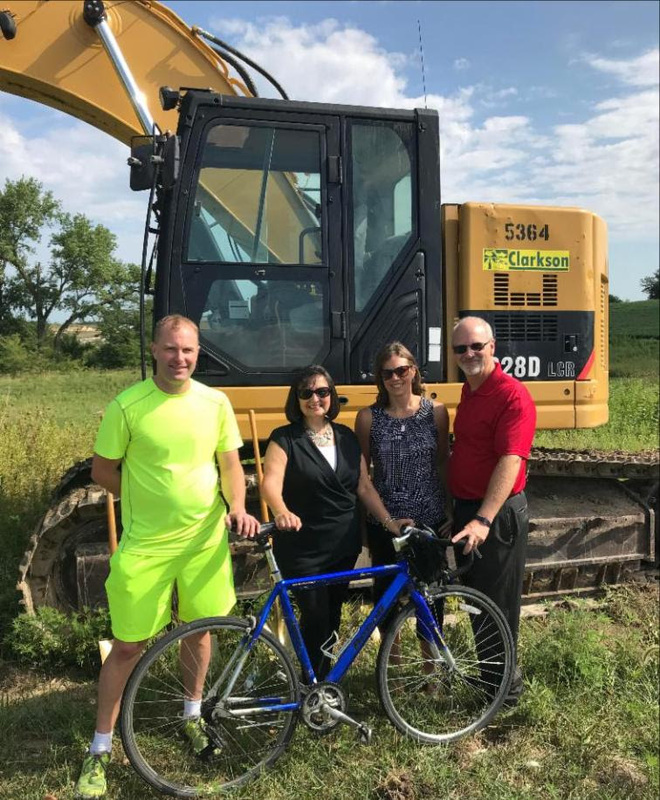 Photo to right: Wes Minder, PCEDC Board Member; Alicia Stephens, PCEDC Executive Director, Stephanie Neppl, PCEDC Marketing/PR Manager; Pete Fullerton, previous PCEDC Executive Director. The City of Kansas CIty will hold a groundbreaking event for the NW Prairie View Road reconstruction project on Monday, August 6th at 9am. Please click here to see the invite for more information. Follow the project's progress here. Harley-Davidson will have its first round of layoffs August 3rd, which will affect 180 employees. The Full Employment Council and Platte County EDC will jointly host a hiring event for the displaced workers on August 10th. Check out our jobs page for several upcoming hiring events! All Platte County companies are welcome to send us information and flyers for any upcoming hiring events, which we will share on our website jobs page as well as on social media. If you have an event to list, please contact Stephanie Deppen. Biolife Plasma Services will open a new center later this year in the Tiffany Springs East development along Ambassador Drive and 152 Highway. The company is holding hiring events July 30-31 and will employ around 70 people. Ignite Medical Resorts will open this fall at 2100 NW Barry Road, KCMO. The 90-bed skilled Nursing Facility will serve short-term rehab patients, long-term skilled nursing patients & expand network of home health/hospice services. Congratulations to Parkville's Evolytics for winning the Top Analytics Agency Award at DAA Quanties. Read more. Weston's new restaurant, Noah's Cupboard, was recently featured on Kansas City Live! - watch owner and chef talk about the new restaurant. See more here. Alicia attended the KCMO Housing Policy Development Focus Group Planning Meeting. Input from participants included a need for housing diversity as well as a need for process and timeline improvements. For more info, please click here. Results of the Housing Survey can be found here. 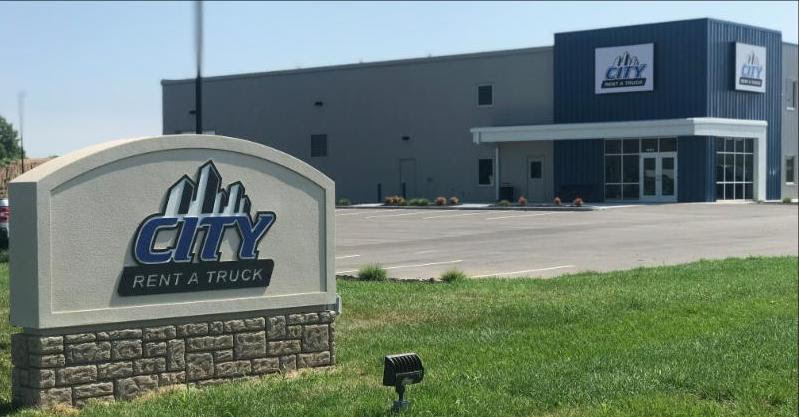 City Rent a Truck held its ribbon cutting earlier this month. An official welcome to the neighborhood! Your new HQ looks fantastic! The City of Kansas City started the process to update the 2009 Trail Facilities Nexus Study, which outlined the need to build public trails near new development projects in KCMO. In the updated study, the City seeks to provide alternatives to an impact fee system and to demonstrate the amount of funding the City would have had for trail construction, if a trails impact fee had been passed in 2009. For more info, click here, and to see the survey findings showing the overall results. click here. Construction on the new I-29 bridge near Tiffany Springs MarketCentre has broken ground. Follow the project here. Click here for the design plan. Skyview from Ambassador Drive to Tiffany Springs Road is slated to begin this summer. Work on 64th Street & Prairie View Road has begun. The realignment of Prairie View to Chatham will ease congestion at the intersection right off the interstate. The intention is for work to be completed by mid-summer 2019. Project details are being finalized for the southern section of the NW Prairie View Road work. Platte City has been awarded matching funds from MODOT for the Highway 92 & I-29 intersection. RideKC's 234 Boardwalk-Antioch has expanded to serve jobs in East Tiffany Springs and West Tiffany Springs, which went into effect July 2, 2018. New service has been added north of Boardwalk Square Park & Ride. The route expanded to add hourly service throughout the middle of the day on weekdays. See the map here for the new route. The route expansion was coordinated in conjunction with Platte County Economic Development Corporation. Click here for schedule. Rosemary Salerno, PCEDC Board member and owner of RT Rustics, has been hired as the new General Manager of the City Market. Read more here. North KC Hospital offers health classes, events and complimentary wellness screenings. See full details for classes on their website or click here for the July schedule. The Kansas City Aviation Department reported that 1,126,145 passengers arrived and departed through KCI's gates in June, a 4.7% increase from June 2017. Passenger boardings were up 4.9%, with a total of 561,454 boarded. For the year to date, total passengers in and out total 5,733,268, up 2.5%. Year-to-date passenger boardings are 2,878,735, up 2.6%. Read more.